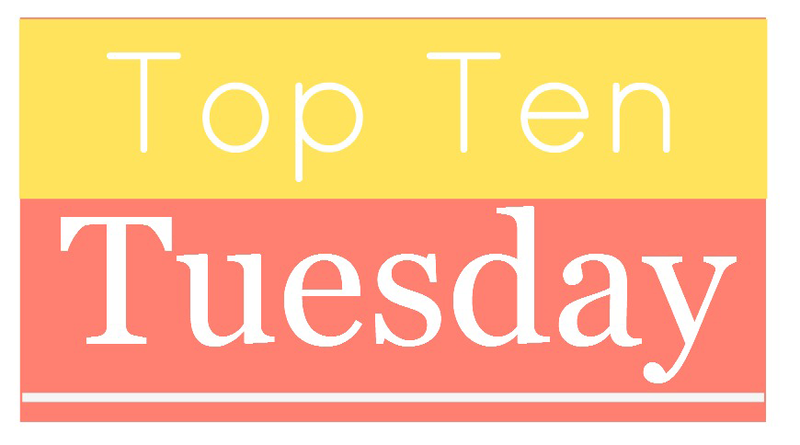 Top Ten Tuesday is a meme started and organized by the Broke and the Bookish. Okay, so somehow, I managed to type up last week's Top Ten Tuesday on Bookish Confessions, but completely forgot to post it. So this week, you get two Top Tens from me. Before I start on this, I want to take a moment to mention that I am currently in the hospital. For those of you who have been following my health and cancer situation, you know that I've been having some major liver problems the past few weeks. Over the weekend, the pain got bad enough that I needed to come to the hospital. I'm currently undergoing all kinds of tests for all sorts of things. As usual, it's my intention to keep blogging, despite my current health situation. Check out my Caring Bridge page for more information. 1.) I have never read The Fault in Our Stars. I kind of feel like this one is some sort of YA sacrilege. And when I was in NYC, I went to so many events and everyone was talking about TFIOS and so many people expected me to be in on the conversation and like I understood everything they were talking about. But I just smiled and nodded and pretended, as opposed to getting the "How could you?" looks for not having read it. But the thing is, I got interested in it last year in July, after being at BEA and hearing everyone talk about it and after hearing that Shailene Woodley would be playing the female lead. I was super excited and I went out and got the book. And then, I got really sick and got diagnosed with cancer ... And I just decided that it was too much too soon. I knew there was some angst and major sadness to it, and I couldn't go into a fight for my life having read about something depressing and thinking that I wouldn't be able to handle this battle. Someday, when I'm further out of the woods, I will read it. But right now, it's still too soon. 3.) I'm OCD about the way I collect books. If I start out buying the books in actual, physical, paper book form, then I have to finish out the series this way. And if I started out buying the books on my Nook, then I have to finish out the series that way. I will NOT have one book from the series sitting on my shelf and the other two on my Nook. That will drive me nuts. Occasionally, though, the system gets overthrown by the powers that be. For example, at BEA 2013, I got the hardcover of The Eternity Cure (book two in Julie Kagawa's Blood of Eden series) autographed. But I'd already purchased the first book on my Nook. I'd actually started reading it there, then decided to wait until the last book came out to binge read them all. But the question was, which format would I buy it in? Would I let the lone middle book sit on my shelf, unaccompanied? Or would I buy the last book in hardcover and let the first book remain solo in my Nook? The question was answered when I went shopping one day and found the first book, The Immortal Rules, on sale in paperback, and the final book, The Forever Song, on sale for a price almost as low as the Nook price. So I bought them both. Because ultimately, having one physical book in the series was just too much for my OCD brain to take. 4.) I got the first Harry Potter book when it came out, but it sat on my shelf for like two years before I picked it up. It was one of those rare times when my mom's mom took me book shopping. Not because she actually liked me but because she did like my brother and this was a tradition my grandpa had started with us, and she couldn't very well take him and not take me, so she did, and we both got copies of Harry Potter and the Sorcerer's Stone. And it sat on my shelf until just after Harry Potter and the Prisoner of Azkaban had come out and all of a sudden, Harry Potter was everything to everyone and was everywhere you went. I remember thinking to myself "Huh. I think I have the first book somewhere." I went to find mine to read it. And somehow, my brother -- who I had to convince to get the first book when we went shopping that day -- was already on top of things and had already gotten and read Harry Potter and the Chamber of Secrets and Harry Potter and the Prisoner of Azkaban. It's worth mentioning that we have no less than four full sets in our house now, plus a few lone stragglers. My dad works for a company that buys textbooks (and occasionally library books) from schools to have them rebound and sold again. And often, he's been at schools that were closing and where all the library books were just going to be thrown out, so he usually buys whichever Harry Potter copies are left. I think we have six or seven copies of book 3. 5.) In addition to being a proud bookworm I am also very much a gamer -- but this is a part of my life that I have kept secret until just the past couple years. I guess when I was growing up, I was afraid people would pick on me for being a girl gamer. But I have lost track of how many Christmases the number one gift on my wishlist was either the newest installment of Pokemon or a new device. I play mostly friendly games and only Nintendo. I like Zelda games, Mario games of any kind, puzzle games, and Pokemon. My favorite games of all time are the Luigi's Mansion games for Gamecube and the newest one for Nintendo 3DS. When I was in middle school and guys would bring their video games to school or my brother would have his friends over, I would pretend I knew nothing about Pokemon or Mario Kart or something like that and end up annihilating them and calling it beginner's luck. It was one of my favorite things to do. 6.) I've never read or watched Pretty Little Liars. I own the first book. But I've wanted to read other books more. But I do plan to read and watch them at some point. I have Netflix, so I have access to all of the episodes. Although it makes me a little depressed because they used the set for Stars Hollow (from Gilmore Girls) for PLL. And I'm still bitter that GG went off the air after only seven seasons and with a really cheapened ending. So there's a part of me still grieving that isn't ready for PLL. But if I ever manage to get my knee replaced, I plan to binge everything PLL. 7.) Since I've been on Goodreads (which is about 5 years) and keeping track of the books I complete, I've only not finished three books. And one is by one of my favorite authors ever. That book was The Almost Moon by Alice Sebold. I love Alice Sebold. The Lovely Bones is one of my favorite books of all time and her memoir, Lucky, is definitely my favorite memoir of all time. But I just couldn't get into The Almost Moon. I tried over and over again. I tried at least five times. And at least five times, I was seriously creeped out and not in the good or interesting way or even the compelling way. But creeped out in the way that made me want to vomit and that actually made me take a Xanax. 8.) I have more than 200 books on my TBR shelf. Like books that I actually own, not just ones I want to someday own and read. Between my Nook (which is the e-books I purchase), my Kindle (which is where I receive e-ARCs for review), and then actual physical books (either ARCs or purchases), there are well over 200 of them. But I always find a reason to buy more. 9.) The Gossip Girl book series is my guilty pleasure. But I actually loved the TV show more. On New Year's Eve in 2007, I went to the bookstore with my family, something we don't always do, but have done often during the holidays. On this particular New Year's Eve, we weren't just browsing -- we were all shopping for books because we were about to get a blizzard that would snow us in for several days (and the forecast was actually spot on for a change), so we were getting ourselves something to do that couldn't be interrupted by a power outage. I got quite a few books that night, but I don't remember most of them. My sorority sisters had been telling me about this awesome TV series Gossip Girl and a book series by the same name that it was based on. At that time, there were 11 books in the series and one prequel book, for a total of twelve books. I tore through them in under four days. They were fun, fast, witty, and really just pure entertainment. They weren't very deep, but that was totally fine with me. At that time, the very first season of the show was in the middle of airing (or attempting to, anyhow, with production being cut mid-season due to the 2007 Writers Guild of America strike). But I didn't start watching the show myself until the summer of 2010. I started watching them on DVD and then finally started watching the show live with the rest of American beginning with season 4. My hesitation to start watching the show came from loving the books and being afraid that the TV show wouldn't be as fun. But Gossip Girl as a TV show was a rare exception to the rule -- it was even better than the books. But the novels have earned a permanent place on my shelf -- I've reread them all at least three or four times. 10.) I've never read Sarah Dessen. I'm into contemporary now, so I feel I should. But I have no idea where to start because she's written so many books. Any recommendations, guys? I hope you enjoyed this belated Top Ten Tuesday on last week's topic. The one that actually is supposed to be today will follow shortly! I haven't read John Green either. Just found your space! Super cute and I loved this post!! I too have multiple, multiple copies of HP laying around! My nicest set in its place of distinction on the shelf! All after waiting and swearing I wouldn't like them (haha)! I have read all of Sarah Dessen's books though it has been a while... I know I really liked Lock and Key and What Happened to Goodbye. I also haven't read Fault in Our Stars and am debating on if I want to. Guess we shall see! Excited to explore your space more :) Have a wonderful day! !